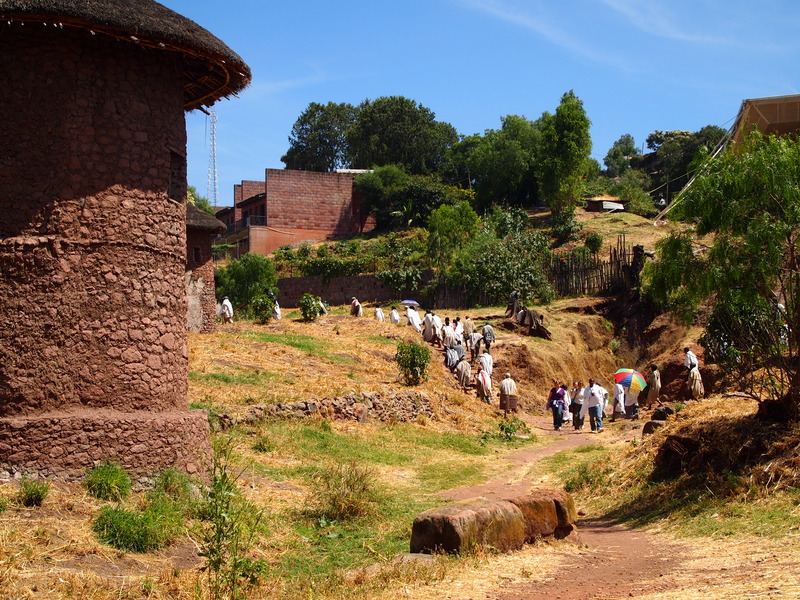 Friday, October 26: We leave the northern group of Lalibela churches and head through the preserved tukul village known as Hadish Adi. 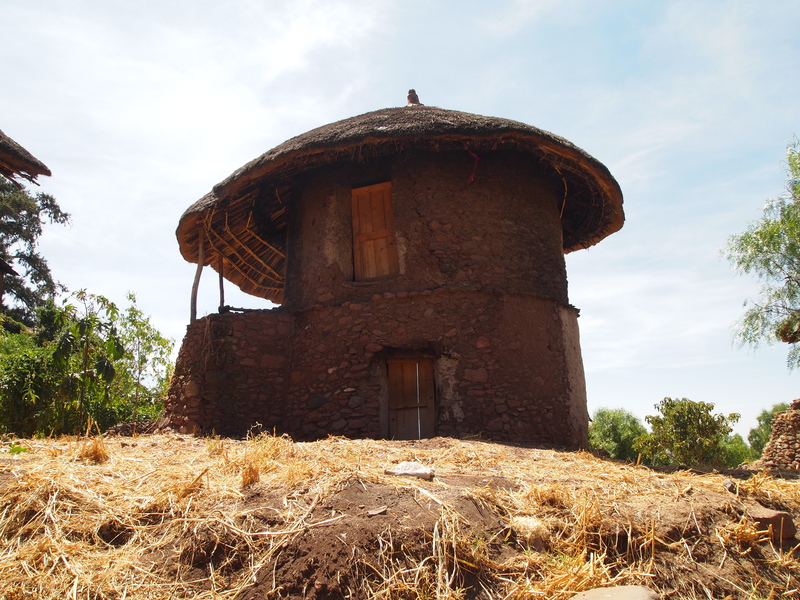 Now the site is protected so that visitors can see the round thatch-roofed homes inside and out. 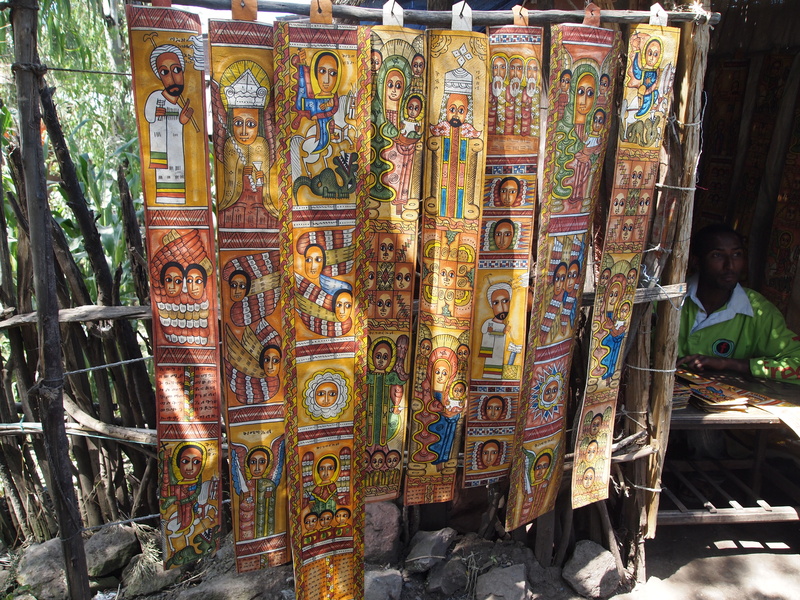 As we walk through the village, heading to the masterpiece church of Lalibela, Bet Giyorgis, we catch sight of a column of white-clad worshipers traipsing through the tukul village, probably after attending the chanting service we witnessed at Bet Mikael. 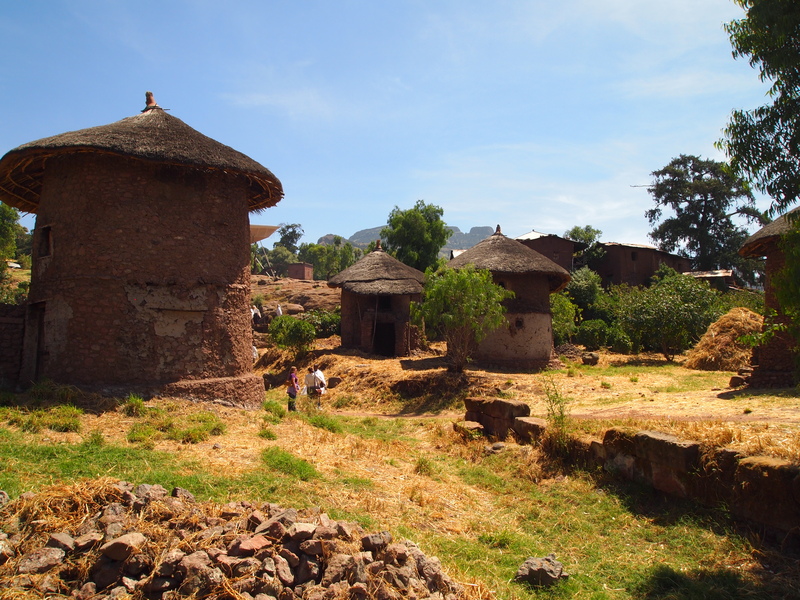 According to a 2010 Mission Report by UNESCO, the traditional housing of Lalibela is characterized by two main types of buildings: the circular one-story tukul houses (ground and one floor), with external staircases leading to the upper level and the rectangular one-story residences (ground and one floor). There are also circular single room buildings on only one level. In both cases, the walls are built of stone laid in mud mortar. The interior surfaces of the walls are often plastered with a rich mix of earth, straw and cow dung. The earth is mixed with straw from the teff plant (Eragrostis tef) and the mixture is applied to the wall after undergoing necessary processing. 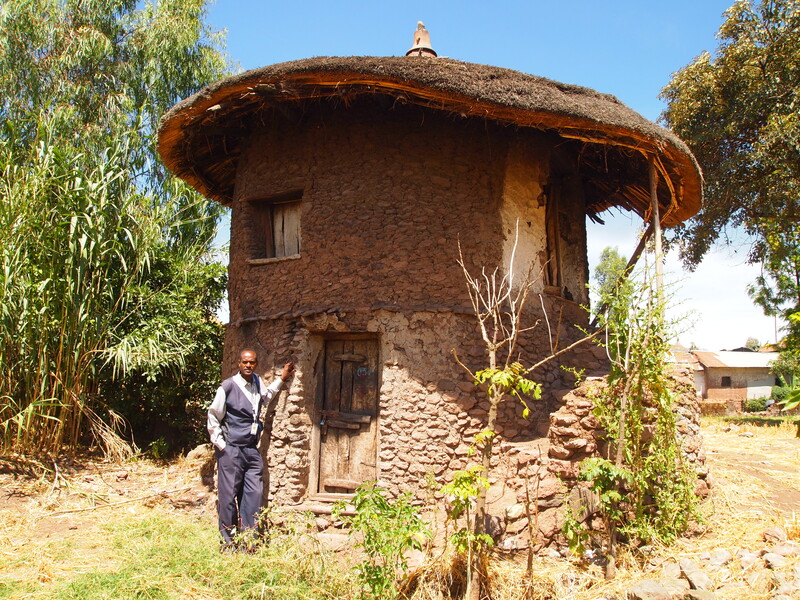 Sometimes cow dung is used almost completely on its own as a plaster for the internal and external wall surfaces. 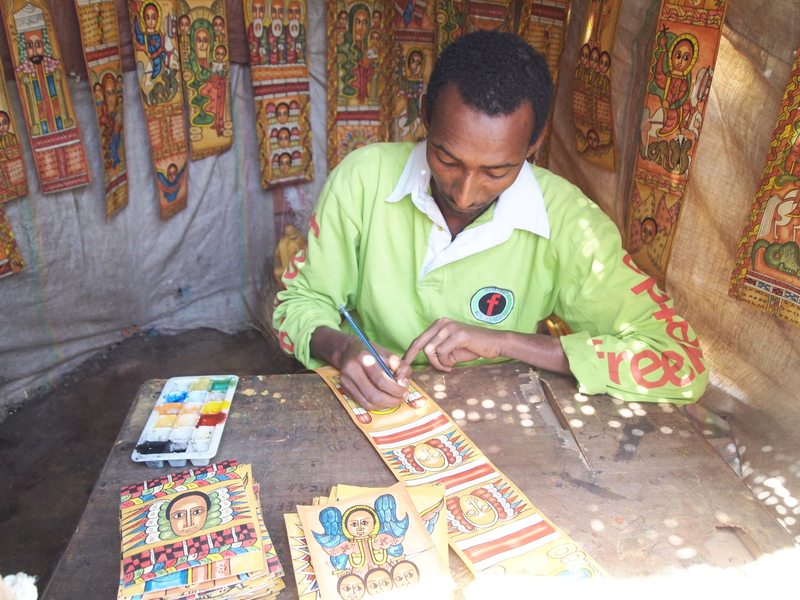 We head to a little open air hut where an artist is painting scrolls in the Lalibela style. I can’t help but buy one. I love the symbolic style and color of these painted scrolls. While we browse through the scrolls, a large group of boys surrounds us and asks if we will buy them a football (soccer ball to Americans) for 500 Ethiopian birr (about $28). They say they are a sports team called Team Obama and they really NEED a new ball. 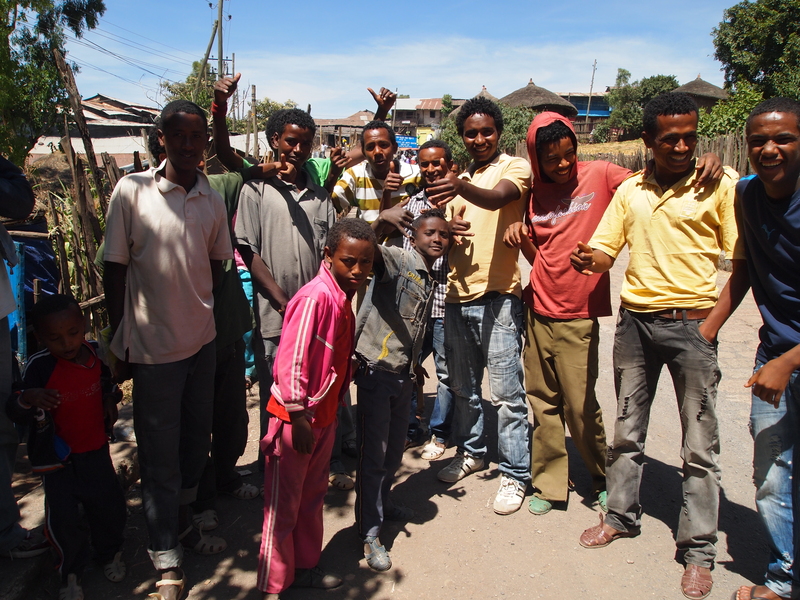 However, we have been warned not to give children any money in Ethiopia because it only entices them to stay out of school. Apparently, a common ploy is to ask tourists for soccer balls or school books, which the children may even buy in the tourist’s presence. As soon as the generous victim’s back is turned, the children return the books or balls to the shopkeeper for cash. As Masala advises, we tell the boys we cannot help them, and we head southwest to the magnificent Bet Giyorgis.